Uncle Ben and Aunt Kelly come to visit. Aiden went in for his 1-Month doctor's appointment. He now weighs 11lbs 4oz and is 22 1/2 inches long. The first game the entire team was there. 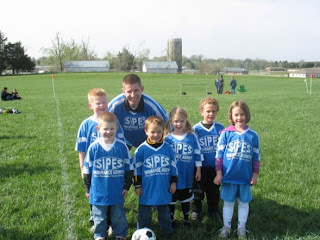 From left to right: Damon, Xavier and Coach Adam, Dillon, Ainsley, Aidan and Indigo. 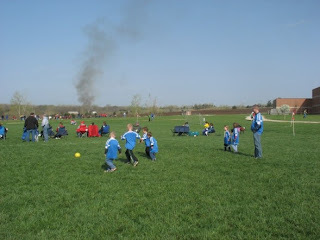 The boys had another soccer game. This time they played against a friend's team, Curtis Chandler. We won 6-2. Damon scored 3 points. He really did such a good job. 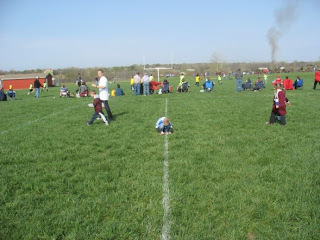 There were several times that he broke away from the group of kids and kicked the ball all the way down the field. If the field wasn't so long and/or he had a little more steam, he would have scored a couple more times. Xavier seems to only last half of the game now days...which is about 3 times longer then what he used to do. The rest of the game he spends messing with his clothes or picking grass. Its just too funny. So many times the ball will be right in front of him but he is just too "busy" to notice it. Adam says even when he is actually playing he is watching the other kids more then he is the ball. As we were walking home from getting Damon at school we see 3 guys running in just shorts. Xavier stops and yells, "Momma, did you see those men? They were naked!" I said, "They had shorts on and running shoes." He answers back, "No, they had tightie whities on." The boys had a double header Saturday. They won the first game and lost the second. They were just way too tired for that second game...at least that is our excuse. Damon has been begging to feed Aiden, I finally caved and let him do it. This was Aiden's first day at Church, of course he was the cutest baby there! Uncle Ben and Aunt Kelly came up from Texas to visit the family and to meet our Aiden and Ashley's husband James, who was home for a couple weeks from Iraq. Every Sautrday Adam has the boys wash their sheets and blankets and then after they make their beds. Adam helps them a bit but for the most part they do it themselves. Well this time, Xavier was in a mood and didn't want to make his bed. He insisted that he needed help which turned into a big whiney fit. It wasn't pretty. So we left him in his bedroom. A little while later Adam checks on him. He had one corner on and then curled up on the floor in his blankets. Damon and Xavier had their first soccer game. Adam is there coach. Damon really likes it. Xavier is ok with it. On the way to the game, I asked Xavier if he was excited, he said, "No." After the game, I asked if he had fun, "No, not really." They did end up winning, 6-0. Damon scored once. Aiden went to his Doctor appointment today. He is back to his birth weight of 8 lbs 14 oz. He has also grown 1/2 inch. I think the nurse really liked him, she carried him around showing him to all the nurses.